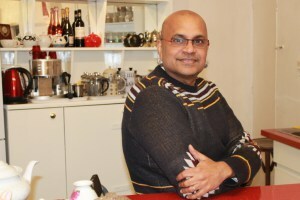 We were recently interviewed by the lovely people at BrixtonBlog.com. Here’s the full story – or you can read it on their website here. A major exhibition, West Africa: Word, Symbol, Song, opened earlier this month at the British Library, celebrating West African culture and literature. Alongside drum language, manuscripts and a room devoted to Afrobeat legend Fela Kuti, the exhibition includes a specially-commissioned carnival costume created by Brixton-based designer Ray Mahabir. Already an esteemed carnival costume designer, Ray’s intricate costume doesn’t disappoint in terms of either flamboyance or rich multi-cultural significance. 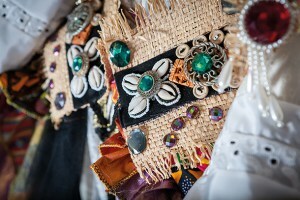 Marrying folk and carnival history, his costume is loosely based on the tradition of Bele or Bel Air, a drum dance and song closely linked to Caribbean history and a Douietter, an 18th Century dress with a stiffly starched white cotton petticoat, richly embellished with lace and edgings. The bespoke creation took no less than two weeks to make and comprises different elements and fabrics from African, European and Caribbean traditions. 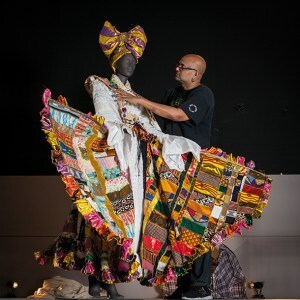 Ray Mahabir’s carnival costume will be on display at the British Library from Friday 16 October – Tuesday 16 February, for opening hours and admission prices head to www.bl.uk/west-africa-exhibition. To book a workshop with Ray, visit www.sunshineiarts.co.uk.